KONA IP brings all of the expertise, power, quality and reliability behind the KONA product line, to the world of Video over IP. On the desktop, KONA IP seamlessly supports Apple® FCPX, Adobe® Premiere® Pro CC, Avid® Media Composer®, AJA Control Room and other leading editorial, effects and production tools. For creative users the experience of using favored applications remains unchanged, with some differences only in setting up for capture or output with the same AJA Control Panel creative users are used to. For developers, the same AJA SDK used for SDI and HDMI devices is also used for KONA IP, meaning zero delay in writing applications and creating systems with this powerful PCIe capture and output card. And for any critical/enterprise scale media production installations, the additional peace of mind that comes with a 3 year warranty, advance replacement and support via phone is standard with all KONA cards. KONA IP is designed to fit into either hybrid or all-IP infrastructures, while bridging that familiar KONA experience that professionals rely on for critical work, into Video over IP workflows. 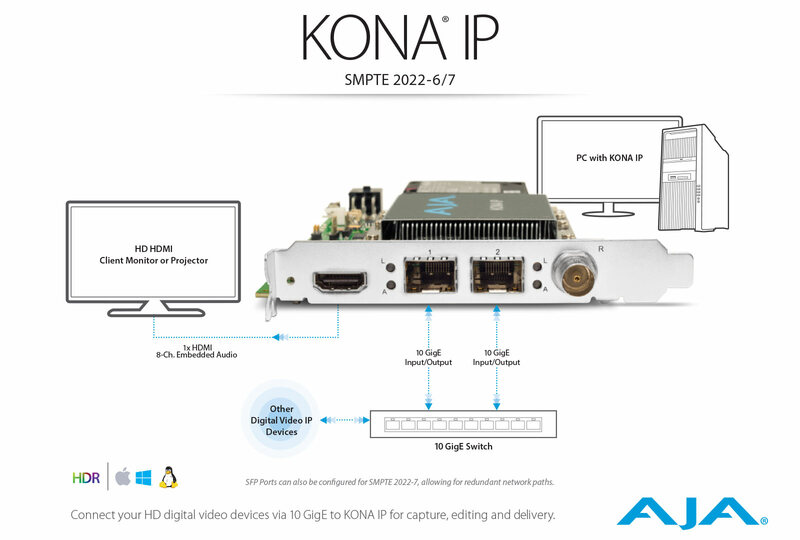 KONA IP offers SMPTE ST 2110, SMPTE 2022-6/7 uncompressed IP video standards, including network redundancy/Hitless Switching, as well as optional JPEG 2000 support. KONA IP supports leading NLE, Compositing and Streaming applications via our industry best plug-ins, plus the AJA software tools you rely on including AJA Control Room and AJA Control Panel. With Desktop Software v15.2, KONA IP offers extended SMPTE ST 2110 support with the addition of ST 2110-40 for ANC data; for transmittal and reception of timecode, closed captioning and more. Broadcasters and facilities are able to synchronize production of audio, video and ancillary data elements, eliminating the need for embedding/disembedding to/from SDI while also reducing latency. AJA NMOS is an optional component within the AJA Desktop Software installer. When running, it enables NMOS based discovery, registration and control within software defined video networking environments, and resides in the system tray of your OS. Right clicking on the application provides access to log and status information and provides an option to exit if required. If you choose to install AJA NMOS and during that dialog also choose to have the application autorun, then it will automatically start upon power up or reboot. Aside from the ability to capture and playback uncompressed SDI compliant video, with up to 16 channels of embedded audio and ANC via SMPTE ST 2110, KONA IP also bridges nicely into the creative suite or edit bay with a local HDMI output with 8 channels of embedded audio, and support for HD frame rates up to 60p. KONA IP with the latest AJA Desktop Software provides HDMI based HLG, and HDR10 support with HDR Infoframe metadata, for output to compatible displays, in accordance with HDMI 2.0a/CTA-861.3. Check with your software vendor to ensure their application supports this valuable AJA hardware feature. KONA IP has two 10 GigE SFP cages for multi-channel input and/or output enabling effective reception, delivery or both. Mix and match based upon your project's needs while working with high quality 4:4:4 or 4:2:2 2K/HD/SD video and 16-Channel embedded audio. 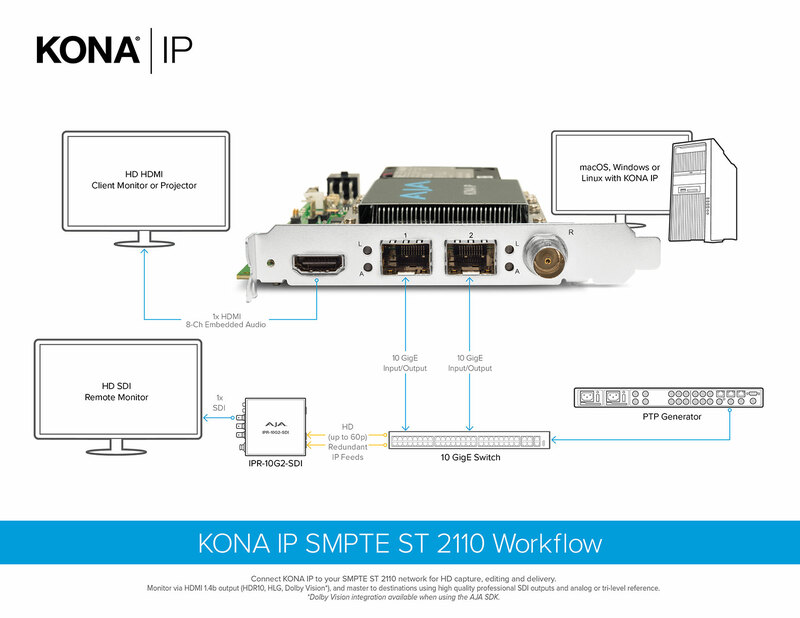 Connect KONA IP to your SMPTE ST 2110 network for HD capture, editing and delivery. SMPTE 2022-6 support for transmission and distribution of uncompressed 3G-SDI and 1.5G-SDI with sixteen channels of audio. SMPTE 2022-7 is also supported allowing for simultaneous delivery of data across dual network paths, for redundant signal support crucial for broadcast needs. This optional KONA IP firmware license enables compression and decompression of HD video in real time to/from JPEG 2000 encoded within an MPEG-2 transport stream. Featuring support for TR-01, the update ensures interoperability with other JPEG 2000 systems and devices across the network. *HDR support is application dependent. 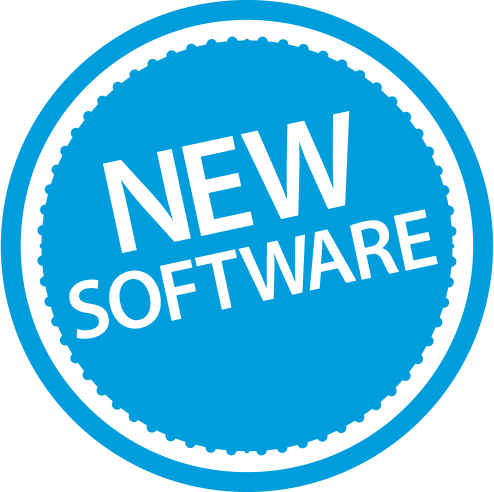 Check with your software manufacturer for compatibility.